A glacial-cut valley, Mineral King is surrounded by 12,000-foot granite and shale peaks. Pick a site alongside the Kaweah River or in the shade of aspens. For homemade pie and a shower ($5; bring your own towel), head to nearby Silver City Mountain Resort. $12 (plus $20 park entrance fee per vehicle); no reservations; 559/565-3341. Riverfront sites overlook the Upper Middle Fork of the San Joaquin River; some have views of Minaret Falls. The short hike to the Devils Postpile National Monument lava formation is a must. $20 (plus $7 transit fee); no reservations; 760/924-5500. In California’s Sierra Nevada, Shaver Lake makes a cool summer retreat. Bishop Creek flows past, and 2 miles away is trout-filled Lake Sabrina. Trails lead into the John Muir Wilderness with access to mountain lakes and the Sierra crest. Dine alfresco on hamburgers and homemade pie on the patio of the Lake Sabrina Boat Landing Cafe ($; 760/873-7425). $21; no reservations; 760/873-2500. At 10,000 feet, this is the highest drive-to campground in the state and has a dramatic, above-the-treeline feel. Insider tip: Just ¼ mile from the campground, you can hop a water taxi ($10 round-trip) across Saddlebag Lake for an easy hike into the stunning 20 Lakes Basin. $19; no reservations; 760/924-5500. Camp on a huge lagoon bordering the Pacific Ocean. The brackish water is relatively warm, and rich with river otters, shorebirds, and steelhead trout. Launch your canoe right from your campsite. Rent a kayak from Kayak Zak’s (from $15/hour) and paddle up to the sand spit to search for agate. $18; no reservations; or 707/445-7651. Camping in California’s Lassen Volcanic National Park puts you within footsteps of creek and forest scenery. 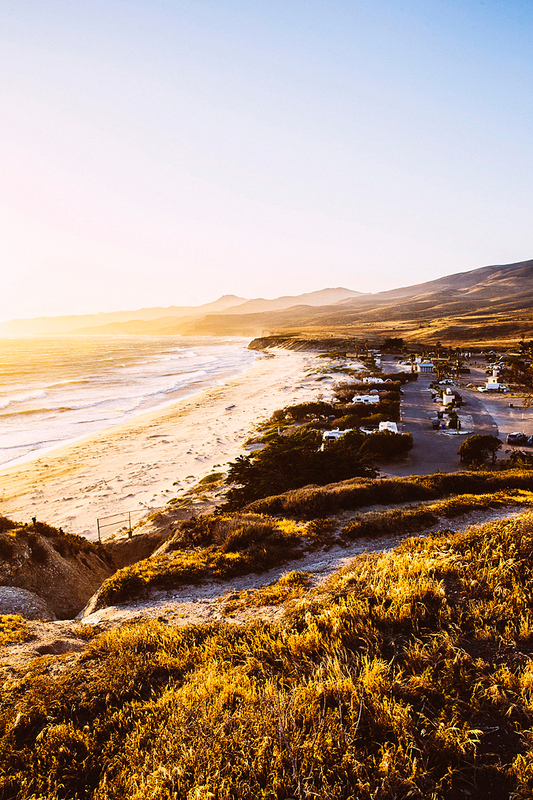 A drive-to campground with backpack-worthy scenery. You’ll be drinking your morning coffee with one lake in front of you and another lake behind. Hit it in late June or early July to catch swaths of wildflowers framing high, craggy peaks. Opens in late Jun; $8; no reservations; 209/795-1381. A million miles from everywhere, this small campground lies where a country road dead-ends at the Pacific. Summer weekends are crowded, but midweek you’ll have the windswept beach and surrounding headlands to yourself. Fill up your gas tank before leaving U.S. 101. There ain’t nothing out here. $8; no reservations; 707/986-5400. Part of the “wow” moment of rolling up at Pinnacles National Park, about two hours south of San Francisco, is the unexpected contrast. One minute you’re on a grassy country road, then suddenly: a shambling sky-high rock castle. In January 2013, Congress upgraded Pinnacles from national monument to national park, in part because of the park’s condor recovery program and the talus caves and rock spires that beckon climbers. From March into May, poppies and purple bush lupine create a colorful backdrop for hikers and bird-watchers who ascend the spires for views that stretch forever. Easy-peasy access to idyllic alpine scenery. Nab a site in the small, quiet, pine-and-granite campground, then stroll over to a gorgeous, fish-filled lake to watch for dive-bombing osprey. Arrive by lunchtime Friday to get a good site. Opens Jul 1; $22; no reservations; 209/295-4251. Hike into Desolation Wilderness from the west. Great camping too. (530) 644-2349. Surrounded by a banquet of granite domes, Courtright Reservoir is a rock climber’s paradise situated at 8,300 feet. A trail from the campground runs along the lakeshore to prime fishing spots. Nearby trails access the John Muir and Dinkey Lakes Wilderness. $18; no reservations; or 559/855-5355. and quirky upcycled art, like old teapots transformed into lamps. The centerpiece is the 3,000-square-foot Commons, which has a camp store and swimming pool along with bathrooms and laundry facilities. From $90. It’s a kayakers’ and bird-watchers’ paradise. Serene Lewiston Lake has a 10 mph speed limit, making it perfect for paddlers and birders hoping to spot a bald eagle or osprey. Seventeen tent-only sites provide views of the lake and the Trinity Alps; six tent cabins offer luxury. The history-rich towns of Lewiston and Weaverville are nearby. $14 tent, $79 cabin; Apr–Sep; . It’s set in a grove of towering coast redwoods that give the campground its name, with easy access to trails leading to Sempervirens Waterfall. $35; late Mar–Nov; . 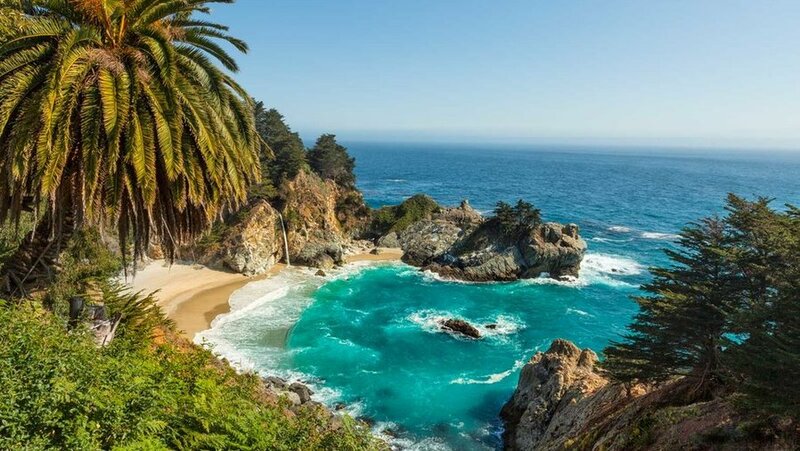 In Big Sur, campers rough it in the redwoods and then have access to the resort’s spa and Japanese bathhouse at the top of the canyon. On 15 wooded acres just 2 miles from Nevada City, you’ll find a campground with a community vibe. The grounds include tent and RV sites, plus 15 canvas tents with handcrafted and antique furnishings. A common building features bathrooms, a communal kitchen, and general store. Guests staying at Guerneville’s are bound to make friends at the Richard Neutra–inspired clubhouse pavilion (stocked with craft beers and local wines) before retreating into one of the camp’s 24 Airstreams on Sonoma’s Russian River. These aren’t your ordinary silver midcentury moderns but custom models styled by Dan ­Weber Architecture and ­Geremia Design. Walnut cabinetry, a full shower, and Casper mattresses make this an alfresco overnight that’s more like a true ­hotel experience. From $175. In Guerneville, 23 Airstream trailers put the luxury in camping, with Casper mattresses, hotel-quality linens, spa showers, and fire pits. Wooded walking paths lead to lawn games and a Frank Lloyd Wright–inspired communal pavilion. Part of the Pacific Crest Trail passes along the east side of the Jackson Meadow Resevoirreservoir, which also makes for a good fishing spot. Set in the Grapevine Canyon wash, this is a great base for exploring northern Death Valley. Tour the Spanish-Moorish mansion, Scotty’s Castle ($11; 760/786-2392), and walk the rim of Ubehebe Crater. With a high-clearance car, you can take a day trip to Eureka Dunes, California’s tallest sand dunes. $12 (plus $20 park entrance fee per vehicle); no reservations; 760/786-3200. Sites are tucked among jumbled piles of the quartz monzogranite boulders of Joshua Tree. A couple of miles from camp, a trail leads 1.5 miles up to the 5,461-foot summit of Ryan Mountain. $10 (plus $15 park entrance fee per vehicle); no reservations; 760/367-5500. Watch a desert sunset or a dazzling star show from the top of a massive boulder, then crawl into your sleeping bag when the night turns cool. The gargantuan rocks also provide a cozy sense of privacy for most of the 31 sites. During the day, take the strenuous hike to Ryan Mountain’s view-filled summit or visit the ruins of the 1890s Ryan Ranch. Secluded sands in Santa Barbara County. At Red Rock Canyon, colorful sandstone walls rise from the desert floor, and campsites are tucked against the White House Cliffs. The stargazing is so exceptional here that rangers post constellation charts detailing each evening’s display. $12; no reservations; 661/942-0662. The Trailer Pond at Alta Colina Winery in Paso Robles offers five beautifully restored vintage trailers on winery grounds. All-inclusive packages get you wine-and-cheese tastings, catered breakfasts, and hikes around the property. The Coachella and Stagecoach annual pop-up camp in Indio just got fancy with safari tents featuring down bedding, 500-threadcount sheets, lounge chairs, and screen doors. Vacation homes at Anini Beach go for top dollar, but camping at the grassy park is practically free. Keep your eyes peeled for the rare Ni‘ihau shells that sometimes wash up on the sand at this calm, sheltered beach. Closed every Tue (for maintenance); $3 per person (permit required); 808/241-4463; for reservations, submit permit application by mail. Expect new guides and top-notch gear for these solo and guided kayak camping trips in Kauai. Camp in a tent, cabin, or teepee in Baja’s Esenada for easy access to horseback riding, mountain biking, and water sports. Bonus: Cabins feature full bathrooms and hot water.